First Paragraph: The storm had blown itself out by the following morning, though the ceiling in the Great Hall was still gloomy; heavy clouds of pewter gray swirled overhead as Harry, Ron, and Hermione examined their new course schedules at breakfast. A few seats along, Fred, George, and Lee Jordan were discussing magical methods of aging themselves and bluffing their way into the Triwizard Tournament. Hi there, Esteemed Reader. Sorry to have had to leave you hanging last week. We were moving and as I've mentioned previously, there's a little ninja on the way. Mrs. Ninja may be eating for two, but I was moving for two, and it kept me from my Harry Potter duties. To be honest, my life is about to change in a whole bunch of ways I can't foresee. In the meantime, I'm trying to remain calm and write. As I type these words, I'm staring out my new office window at a lovely forest and a river with wildlife scurrying about. With such an amazing view to inspire me, I have no doubt I'll still be spending as much time as I can right here concocting stories and blog posts for you. How much time that will be exactly I can't say as I've never lived with a baby before. We're taking morning sickness and hormones and all the rest of it one day at a time at the Kent home. And that's how it will be here, Esteemed Reader. I'll do my best to get up a few posts a week, but we're going to have to take this one day at a time. Squeezing the bubotubers was disgusting, but oddly satisfying. As each swelling was popped, a large amount of thick yellowish-green liquid burst forth, which smelled strongly of petrol. They caught it in the bottles as Professor Sprout had indicated, and by the end of the lesson had collected several pints. “Can I have a look at Uranus too, Lavender?” said Ron. As always, when I'm about to pick on Rowling, I must acknowledge that she has more craft and creativity in her little toe than yours truly has in his whole body. In a writing contest between me and J.K. Rowling, I'm not even considered a competitor But I like bearing witness to the hideous adverbs in speech attribution that add nothing littered throughout the Harry Potter books. I enjoy finding these things as it assures me Rowling actually wrote a story from nothing and wasn't taking divine dictation. Chapter 13 isn't just about adolescence and homework. It's called Mad-Eye Moody because this is the chapter in which Rowling better establishes the character of the new Defense Against the Dark Arts teacher. 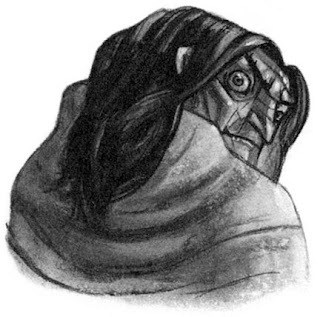 She's got to make us like Mad-Eye Moody and as he's my favorite character in the series, even if (spoiler) he's not really him, I'd say she's a success. But she's also got to play fair and give the reader a chance to solve the mystery before it's revealed. The second half of Chapter 13 is absolutely brilliant, hideous adverbs or no. Rowling wants to emphasize to us that there were strange going-ons at Mad-Eye Moody's place. In Chapter 11, Rowling told us a version of these invents, using Amos Diggory's burning head and toast as a distraction. In Chapter 13 she gives us more details about this event the reader has to be aware of in order for the end of the story to make sense. In Chapter 11, Rowling also gave us reason to hate Draco Malfoy. Granted, returning readers will hate Malfoy from previous books, but Rowling never relies on that. “Imagine them not even getting his name right, Weasley. It’s almost as though he’s a complete nonentity, isn’t it?” he crowed. Arnold Weasley, who was charged with possession of a flying car two years ago, was yesterday involved in a tussle with several Muggle law-keepers (“policemen”) over a number of highly aggressive dustbins. Mr. Weasley appears to have rushed to the aid of “Mad-Eye” Moody, the aged ex-Auror who retired from the Ministry when no longer able to tell the difference between a handshake and attempted murder. Unsurprisingly, Mr. Weasley found, upon arrival at Mr. Moody’s heavily guarded house, that Mr. Moody had once again raised a false alarm. Mr. Weasley was forced to modify several memories before he could escape from the policemen, but refused to answer Daily Prophet questions about why he had involved the Ministry in such an undignified and potentially embarrassing scene. “And there’s a picture, Weasley!” said Malfoy, flipping the paper over and holding it up. “A picture of your parents outside their house — if you can call it a house! Your mother could do with losing a bit of weight, couldn’t she?” Ron was shaking with fury. Everyone was staring at him. We could not hate Malfoy more at this moment and as a suitable punishment is about to befall him, that's as it should be. But see also how Rowling has built reader sympathy for Ron without needing to tell us he's reacting "moodily." Ron's subplot is a thread we've been following for chapters now and it's fascinating to see how Rowling builds a case for Ron's perspective before the reader knows why we need to consider Ron's view of things. The big argument between Ron and Harry later will be all the more poignant because we'll understand where Ron's coming from. “Leave — what?” Harry said, bewildered. “Not you — him!” Moody growled, jerking his thumb over his shoulder at Crabbe, who had just frozen, about to pick up the white ferret. It seemed that Moody’s rolling eye was magical and could see out of the back of his head. Moody started to limp toward Crabbe, Goyle, and the ferret, which gave a terrified squeak and took off, streaking toward the dungeons. “I don’t think so!” roared Moody, pointing his wand at the ferret again — it flew ten feet into the air, fell with a smack to the floor, and then bounced upward once more. The ferret flew through the air, its legs and tail flailing helplessly. “Never — do — that — again —” said Moody, speaking each word as the ferret hit the stone floor and bounced upward again. How could we not love Mad-Eye Moody? The story doesn't end here and we'll be talking more about Mad-Eye in later chapters, but this is without a doubt one of my most favorite moments in the series. I see we've run long, so I'm going to call it a day. But it's a pleasure to be back with you, Esteemed Reader. Join me next week as I've got some great interviews to share with you and, God willing, we'll be discussing Chapter 14 from Harry Potter and the Goblet of Fire. “Beyond cool,” said George, sitting down opposite Fred. “Supercool,” said the twins’ best friend, Lee Jordan, sliding into the seat beside George. “We had him this afternoon,” he told Harry and Ron. “What was it like?” said Harry eagerly. “Never had a lesson like it,” said Fred. “He knows, man,” said Lee. “Knows what?” said Ron, leaning forward. “Knows what it’s like to be out there doing it,” said George impressively. “He’s seen it all,” said George. “’Mazing,” said Lee. Ron dived into his bag for his schedule. “We haven’t got him till Thursday!” he said in a disappointed voice. Nice to see you back with another installment of the Ninja Book Club, I so enjoy it but totally understand all the unknown changes coming down the road for you and Mrs. Ninja. I was curious if you saw the first edition of Harry Potter and the Philosophers Stone that was annotated by J.K. Rowling went up for auction (scored $228,000 for charity). Wish I could have had a peak.